I think that Pope Benedict got off too easy! Would you agree? Would you want to be pope at 85 years old and in charge of over a billion Catholics? age does’nt matter as long as religion is concern. pope john paul the 2nd died in service but did not resign. Well stated. No man knows the mind of another, much less the mind of God and the moving of His Spirit within another man. The Pope is acting according to his inner spirit’s prompting. As I believe in God’s sovereignty, I believe the Pope’s spirit is responding to God’s moving. Thanks for posting. I’m not sure about starting a new fight. I do recognize this as an oppurtunity for the Church to start over, possibly with a more progressive Pope at the helm. I’d prefer that, given my own beliefs about the world. Remember, though. There is a truth and a lie. The church is not some political piece that can just “start over” as if it were making things up and going along with popular belief. It is led by God and has been for the last 2000 years. There are solid truths and the Church will stick with them. Just something to think about. Definitely something to think about. As a Catholic, I trust that he knows what the Lord wants for him. We have dark times ahead and we pray that we are able to weather through it. Thanks for an interesting Blog! Is it not amazing that a simple act by the Pope should bring about so many provoking thoughts? I think, the answer is simpler than all the speculations out there. I wish the Pope all the best and much gratitude for his service. I am certain that his prayers will continue to lift the church as a whole. It may be that he recognized the Church needed a couple of things. One, as you say, she needed someone to go to prayer for her at a whole new level, and in a new way. There’s also a practical dimension to it, I think he understood that she also needed strong, vigorous leadership at a time of serious spiritual danger and attack, such as he couldn’t humanly offer. I truly think it was an act of great humilty and faith. You’ve offered a perceptive take on the situation, thanks. i think pope Benedict had his personal reasons as to why he decided to resign. Could he not have chosen to pray whilst being Pope? can you only chose to pray if you are in a retreat and not being Pope at the same time? I’m asking from the stand point of an atheist so my understanding of what differences there may be in prayer, and perhaps a more exclusive form of prayer, are very limited. The world’s a busy place in the modern era, so the idea that you can’t do your job/calling and pray effectively at the same time is curious to me, I’m not sure what message that sends? I do however, also agree that it takes great courage and humility to walk away from such a role, to take an untraditional approach in such a fundamentally tradition based organisation is really an incredible choice to make when you think about it, what ever your own beliefs are. This is actually a really insightful question, IMHO. It is true that one can work and pray at the same time – prayer can take many forms. It can be liturgical/community prayer such as a Mass in the Catholic tradition or a Service in many of the other Christian traditions. It can be an explicit conversation with God, it can be time simply spent in His presence, it can be the simple laying at God’s feet the work, sufferings and joys of one’s day, one’s life. Being active as the Pope would incorporate all of liturgical prayer, conversational (interior) prayer, time in silent adoration and praise in His presence AND the offering of the tasks involved in a day in the life of the Pope. In light of this, Benedict XVI’s latest move is significant in two key ways. First – this is the act of a teacher who in humility is profoundly aware that HIS work is not going to solve the Church’s problems, repair the scandals, heal the people that need to be healed and whatever else. He knows that only the grace of God can bring about change and improvement – and that this will happen in God’s timing, and not simply when we want it to happen. Benedict trusts God to act in the manner and timing which serves the ultimate good… a bigger picture which none on earth could claim to understand. After an arduous life of work that exceeds the length most people work (if Benedict were a lay person he could have been a retiree living a quiet life that was overrun by his wife’s cats…) he is setting aside the tools and saying “I’ve done what I can – Lord, only You can help us!” In a world focussed on productivity and a person’s utilitarian value – this is a huge statement. The other key feature is SILENCE. Benedict can pray and work, sure – but there is always something going on, something that needs His attention. Quality time spent with God is generally spent in silence. Not just audio-silence. A ‘silence of the heart’ that is ready and waiting to hear the Lord speak. Benedict has an understanding of world-scale problems that we can only guess at – and he will dedicate the rest of his life to laying these problems at the Lord’s feet and entreating Him on the behalf of all in the world who suffer to act, to deliver them. This may not make much sense if one holds that God does not exist – but for the person who accepts the premise of God’s existence, and accepts what He has revealed to us of Himself throughout our salvation history that is documented in the Old Testament, and through the life of Jesus Christ, His Son, as documented in the New Testament – well – there is much sense that can be made of it! I find it interesting that people often view “surrender” as a negative word. Definitions are things like: “resignation…acceptance of despair…capitulation…to yield power or control under compulsion or demand…admitting defeat at the hands of an enemy.” None of this sounds good. But surrendering to God through prayer is not yielding to an enemy, even though some of us may have been brought up w/ a picture of God as a big mean Judge in the sky. No, surrendering to God is yielding to love and to truth. That’s who God is. It’s accepting the offer of peace that Jesus extends to us in the book of John. At its core, I think surrender is simply awakening to the truth – accepting things as they are. We’re not God. We’re not in control. When we walk along the ocean shore, we don’t do battle with the tides, insisting that we are in charge. We marvel at their beauty and power and we don’t “lose face” when we admit we don’t control them. I’m not Catholic, and I don’t know why the Pope resigned. But I do know if he was “surrendering in prayer,” this is not a bad thing. Oh, I think this is just the beginning. We have been dealing with scandal in the Church for ten years now in this country, but the trails are just now leading the world back to the Vatican’s front door. Catholics need to get ready–if Cardinal Mahoney is culpable, and the Lord knows he is, then so is Benedict in his previous roles, and JPII as well. To the extent that it could stop his movement towards sainthood in its tracks. We can only hope Benedict will be more humble and repentant in his exposure than Roger was. For 10 years? We’ve been dealing with scandal in the Church for centuries. What this world needs is another reformation where Christians (of every denomination) step from beyond the shelters of their church (buildings) and actively engage in their communities. My thoughts on the matter of the Pope’s resignation are more for the future and the work ahead for whoever succeeds Benedict. A newly elected pontiff may find it difficult, if not impossible, to implement any needed reforms while dealing with the presence of a still-living former pontiff, who may or may not be perceived as a eminence gris to a newly installed pope. As for Benedict’s “abdication”, I choose to see it as the action of a man who, seeing that change is needed — indeed, required — of the Church to which he has given his entire life, finds himself unable (or unwilling) to institute. Whatever his reasons and to be honest, no amount of speculation will reveal those reasons to be other than those Benedict stated, they are those of man acutely aware of his own frailty. I think Pope Benedict have the main reason why he decided to resign. The Vatican: pomp, vanity, egotism, infighting, hypocrisy, careerism, backbiting, pope mobiles, deception, hubris, pedantry, greed, obfuscation, sins of the flesh, preposterous hats …and prayer. Yes, they pray, too. You forgot red shoes. ‘The Church’ is a very lucrative business. Is that a little boy in the crowd? What he’s saying? “The Emperor has no clothes on.” Be quiet boy. If that’s true, then we’re all lying to ourselves, and we can’t have that. Red shoes for everyone please, Be quiet little boy. This is an interesting view. I personally feel that the pope realizes the trials that are ahead and that he is not physically capable of seeing the fight through to the end. I admire him for what had to be a difficult decision that opens him up for scrutiny and speculation. the time magazine featured an article several weeks ago that also has an interesting view on this. it’s not that he resigned and surrendered. perhaps he simply wishes to exercise influence and power in the shadow. The man is 85 years old! ANY 85 year old deserves to take a break and retire. And shoot, maybe, just maybe, being the pope he may have figured out that the faith thing was wrong? You never know! He is moving aside to allow someone younger and who is in better health to lead the Catholic Church through the challenges that lie ahead. Plus, let us not forget that it was during his tenure as Pope, that so many cases of sexual misconduct among the priesthood was publicly exposed. The latest senior member of the church to be exposed is the Cardinal of the Scottish Catholic Church who has also resigned! Is prayer surrender or fresh thinking? With all the woes besetting the Roman Catholic Church is certainly seems time for that. I have often noticed that christians tend to take the writings of earlier generations as gospel truth … whereas … as God created each human in his own likeness … should there not be an attempt to analyse what you read and juxtapose it to how your mind accepts it in your present. Does it “gel” with your thinking …. its possible that the persons who wrote stuff in the past had their own share of biases and its possible they erred. What I say is not conclusive and possibly more than 90% of it is true ….. but the balance 10% should be reserved for human error …. or put down as a changing of the times. The gathas are the holy words of Zarathustra written more than 4000 years ago and yet when I wanted to simplify them so that the youth of my community would be able to read them too … I did make a few changes here and there … changes which to my mind would be liked by its original author. All the changes were to do with removing negativity from the verses. You see we are spiritual beings … each one of us capable of doing great and grandiose things in this world and in order to do that one must be the beacon of inspiration that others desire to follow. Promise anybody the gift of a beautiful mind ….. you have done God’s work for his own in his own style ….. for many things have been written in the same of God … but there are a handful who are truly true to him … for He truly only comes to you as a friend …. when you really understand the beauty of him. I count myself lucky that I have him as a constant in my life. Just a clarification regarding inspiration of the Holy Spirit. The scope of the claim of the Church regarding inspiration of the Holy Spirit as it pertains to infallibility applies only to an exercise of the office of the Pope to make a definitive statement on matters of faith and morals. As far as inspiration concerning personal decisions, temporal governance or anything else that falls outside of the scope aforementioned – the Pope has the same access as any other baptized member of the faithful. Having said that, the Pope Emeritus in this case was a man of deep prayer. I would not be hasty to undermine a decision that was discerned in prayer by this man. As for your closing remark – THAT, I think, is spot on. I think the Pope Emeritus is doing exactly that – taking the fight to a different level, for as you say, he knows that the fight cannot be reduced to a flesh and blood reality. I think we are seeing first hand a courageous man heeding St. Paul’s exhortation to “put on the whole armour of God” that the Church may withstand the wiles of the devil. Do you think he had a fiath crisis maybe? I think recent events highlight the problem that’s been in plain sight for centuries. A man isn’t supposed to be IN CHARGE of the church. Living in palaces, wearing robes and strange hats, demanding people kiss your ring…. where do we find this example in our Bibles? This isn’t God, it’s culture, of course it’s going to be corrupt. Abraham, Isaac, Moses, Joshua, the prophets and kings. Compare king Hesekiah who had an unbroken line of succession, (Isaiah 22: verses 20 -23) with Matthew 16: 19 “where Jesus gives the Keys to Peter. Hope you can see the connection, if you still have these books in your denominations version of it Can you please tell me where in the bible it says anything about Scripture alone, or Jesus and me, alone?. The church is going through a crisis of faith- one created entirely by the higher echelons in the Vatican. The way Benedict dealt with child abuse was tardy at the very least; his treatment of his friend Hans Kung shameful. What about Cardinals Mahoney and O’Brien, the Vatican bank…it goes on and on. We need a massive change in the church- a Catholic Spring, or the church I have loved for twenty five years will be an object of scorn forever. Whatever the reason he chose to resign, I think it was noble of him to resign if you think you are not capable of it. Would you want a monarch or a president over people if his/her mind wasn’t sharp? I don’t think so. I hope whoever comes after him has The Holy Spirit with him and that he may move the Church in the right direction. Because believe it or not, the Pope still influences all churches and the movement of Christianity. Shall I mention the cliched Serenity Prayer? Surrender isn’t cowardice. I think that it takes a lot of courage and humility to surrender, especially when you are in a position of authority and power. As Catholics, we are taught that the Pope is infallible in his leadership of the Church. If we believe that premise, who are we to question that this decision was made with the best interests of the Church in mind? It always comes down to a question of faith. You either believe or you don’t. I think you have many great things to say in your post. However, remember that the Pope is only infallible when making statements about faith or morals on behalf of the universal church. His leadership itself, how he lives out his papacy, is fallible. This is true for all popes back to Saint Peter and will be true for all popes into the future. No man on the face of the planet is infallible. Those who had a hand in placing a man on such a lofty pedestal are just as culpable for what he does there as he is. The only being in the universe who is infallible and deserves such reverance is God Almighty himself. A mere mortal man CANNOT stand under such a burden of responsibility. Anyone who would consider Benedict’s act as a foolhardly act of cowardice is a fool. I am offended to hear such thoughts voiced, and I am not even Catholic. I really like your thoughts and the question you pose. We all have personal walks with Christ, too; I’m sure Benedict’s decision had something to do with his. With you, all the way. Yet in out times, where multimedia governs the globe. on such a big scale “The Pope” things should not be kept gray! Only God knows our hearts, and we can only speculate as to what Benedict’s intentions were when he made his decision. God tells us to leave the judging to him, because the measure of judgment we pass onto others will be used against us as well. Considering this old geezer once mumbled, “”Although the particular inclination of the homosexual person is not a sin, it is a more or less strong tendency ordered to an intrinsic moral evil, and thus the inclination itself must be seen as an objective disorder.” I’d say we’re in for a treat now he’s gone! As an atheist, though, I’m all for scientific evidence and facts rather than the belief in confabulations. Leaving when the church needed him most??? He should have stepped away from the Vatican way back in the early years of John Paul 2s pontificate. His influence on latter Pope was disastrous and the subsequent uncharitable and un-Christ-like directives concerning the “pastoral” care of “homosexual persons” (how clinical) , women and basically anyone who disagreed with him wrought incalculable damage upon the church. Not sure even the a Super-Pope with nerves of steel, the patience of Job and the compassion of Mother Teresa will be able to salvage Rome at this point I’m afraid. An insightful piece of writing. We know that “the gates of hell shall not prevail against Her” (the Roman Catholic Church). As Michael Voris recently stated, She is not subject to error buy may be subject to disaster. Much prayer is needed. To our Father, we all pray! Never renounce your faith, not in jail, not in front of persecutors, not in death, not in front of the weak, always believe that in the end the the spirit will attend to our needs! Remember that the nourishment of prayer not the very little food, afforded the unjustly imprisoned the power to look death into the eye, and be saved! Flores D’Arcais focuses on the scandals in the Vatican as trigger to Benedict’s resignation. 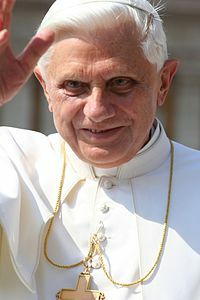 In so doing D’Arcais side-steps the structural difficulties of the Church, which Benedict’s leadership (after his “cohabitation” with John Paul II) had exacerbated. Having declared revelation “complete” and the Church infallible, the latter has condemned itself to the role of epigone and the faithful to spiritual consumers, rather than empowered believers. John Paul II’ decision (with Ratzinger’s concurrence) to expand infallibility from the magisterium extraordinarium to the ordinarium, and their statements on all possible open issues have reduced the role of the Church to one of administrating rather than shaping the faith. As Benedict’s resignation is revelatory of the involution – here D’Arcais is spot on. Meanwhile the world has moved on. The myth of the “primeval couple” committing original sin – which John Paul II solemnly affirmed in 1996 – is increasingly untenable. The whole Pauline/Augustine construction of original sin and redemption is tumbling down. We are all Pelagians now. The application of the “separate but (un)equal” doctrine to women is indefensible. The obsession of the Church with the beginning and the end of life, to the detriment of “living a virtuous life”, is alienating. Having brought “peace” (rather: conformity) to the Church, Benedict belatedly recognized that he had marginalized it. Benedict had brought Vatican II to a close. His successor must now press the red “council button”. It has not gone unnoticed this option would facilitate the cleansing of the Curia. This is the best non-Catholic response to the resignation of Benedict the Humble that I have seen yet! Prayer is not surrender but to step aside from the issues he took on when he became Pope seems to me to be that. Other Pope’s including John Paul II battled age and infirmity and whatever scandal came up. It’s not like these scandals just sprung up suddenly. If I were Catholic I would feel bereft I guess. If I believed that my Pope wasn’t up to the challenge of handling what the church faced and had to step aside. There’s no point in pretending the next pope will actually be successful in defending the indefensible or modernizing the Church while retaining values. Interviews with every single cardinal just point to more of the same. The television ads beseeching those billion Catholics to come home to the church won’t actually bring enough of the developed world ones “home” without substantive change and while if the resignation had been framed that way this could have indeed been a momentous chance for that change. If Benedict had said, “The Church needs to confront it’s past head on, clean up the priesthood (perhaps gasp look at how it self selects for the kind of problems that have been seen) and revision itself for the modern era while holding on to our core beliefs and I am not the man for the job: he would be remembered well in history I think. We all remember John Paul II going about his tasks even when it became so painfully hard to do so,. I am not Catholic but I watched the televsion every moment the day they thought he would die. He was falliable and there were times I was furious wtih him for not taking a chance and changing something but on the whole he discharged the duty of Pope as it has always been understood until the end. You need more than I am old and sick to walk away from being a Pope and honesty about why he was doing so would have done so much more for the Church than just stepping away. It’s not so much surrender as it’s absolutely the least a person can do without having to risk anything at all of any value whatsoever. I am never impressed when I hear a person say “I prayed for them.” But I do value much more the person who is active and working in society to change things. That takes real courage and dedication. Quite a different perspective, and alot to think about here. Prayer is the ultimate surrender, it’s a surrender to God’s will. Through prayer God’s hand can be seen at work in your life. I particularly like how you ended this piece of writing. Perhaps we should all take this fight to a whole other level – to seek guidance in stillness, to seek truth without the distractions and illusions of circumstance and roles. I’ve never been a fan of this Pope, but I do see strength in how he has handled himself these last few weeks. Perhaps bravery doesn’t look like it does in the movies. Thanks for sharing this. My husband and I just had a conversation about this last night, actually. While his decision is unprecedented, I can’t say that he’s wrong. I kind of commend him for it…Really liked your perspective!